Description: A sophisticated architecturally styled fixture is designed with a pizazz that is unique, fresh and stylish. 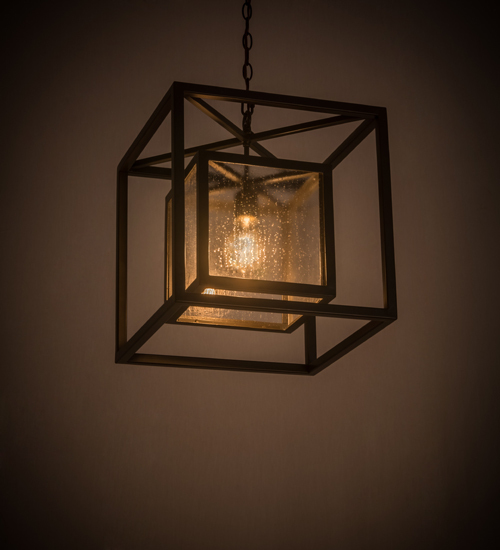 Give decor an extra edge with this breathtaking fixture, which is highlighted with a solid steel structure that surrounds a Rainstone Idalight lens encasing a customer-supplied A19 60-watt lamp. The hardware and frame are featured in a handsome Timeless Bronze finish. Handcrafted in the USA, Kitzi is ideal for installations in grand entryways, lobbies and foyers. The fixture is available in custom sizes, styles and finishes, as well as dimmable energy efficient lamping options such as LED. The fixture is UL and CUL listed for damp and dry locations.